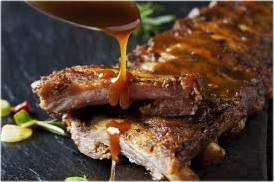 Marinade for Pork Ribs marinade pour cote de porc and Marinating in general is the process of placing meats and other items into a solution that allows it to be absorbed into the item. In our case acidic element like citrus juice or vinegar is added in combination with a series of sugars and salts are used to create tenderness in meats. Natural elements like pineapple, papaya, ginger, vinegar, lemon, and citrus are many times the base of the marinade which can speed up the process of marination all with the primary focus of tissue breakdown and absorption of marinade flavors. Marinating meat can be one of the simplest and easiest ways of bringing flavor to foods. The only real limitation is "time". Planning ahead is crucial to determining the tenderness and importation of flavor that meats experience. In this post we discuss some suggestions regarding the use of marinades. But to get you off to a great start we have listed a number of key marinade recipes we used and tried with success. We like experimentation so we do our best to try as many options as possible. Effective marinating is based on the amount of time allowed and the degree of acidic elements in the marinade. Time-wise marinating can take as little as 1 hour to overnight if desired. Primarily the amount of time required for marinating is related to the size of the cut. Chickens typically take a minimum of two hours and can also take as long as eight depending on the flavor profile and similar to beef marinating. There are some basic common sense rules that one can use to ensure that you get the maximum use out of your marinade. First, consider the type of container to be used when marinating. Marinate meat in a glass, heavy plastic or heavy plastic bags. Using metal aluminum and copper containers may cause the marinades' acidity to react with aluminum or copper and cause both the metal and the meat to darken leaving behind a metallic taste. Remove the meat after marinating and discard the leftover liquid. Use about 1/4 cup of marinade per pound of meat. For example, for 2 pounds of beef or chicken strips, use 1/2 cup of marinade. Make extra marinade and set it aside if you want some of the mixture for basting. Planning ahead by starting the marinade in the morning before work or school will ensure that the meat is properly marinated by the end of the day. Once the meat is prepared and covered with the marinade place the meat covered, in the refrigerator. Don't leave meat in marinade longer than 12 hours. Over-marinating can make the meat mushy. Never allow marinating meat to sit out at room temperature -- even for a short period of time. Discard all marinade that has touched raw meat. Do not use it in cooking. DON'T use marinade from raw meat or fish as a sauce. Try teriyaki marinade for an Asian dish, a red-wine based marinade for steak or a yogurt-based marinade for a Middle-Eastern dish. We've assembled 14 of our best marinade recipes for your use. Just following the ingredient gathering process and blend accordingly. Keep in mind the size of meat or type of meat desired for marinating and the time on hand to get the marination process completed. Blend ingredients and apply in a container. For best results allow the marinade to work for 2 or more hours. Blend and cover your steak and let rest for a minimum of 2 hours. Blend all ingredients and place in container or bag. Insert flank steak and let marinate overnight. Remove steak from marinade and barbecue. Discard marinade after use. Mix all ingredients except ribs in a pan and bring to boil. Lower heat to medium and cook about 10 minutes. Place Ribs in a container and cover with marinade. Soak Ribs for three hours until tender. If desired, Ribs can be soaked overnight for a better taste. Lemon Zest Pork recipe makes quick work of basic ingredients turning them into a wonderful meal good for dinner or barbecue. Bourbon Marinated Pork Ribs recipe is delicious with the subtle flavor of bourbon marinated throughout the ribs. Blend ingredients and marinate ribs for a minimum 2 hours. Our best bbq rubs and sauces for sale can be found online on our website Jake's Famous Foods. See our natural bbq rubs and sauces for sale today.